I work for a software company. We are trying to create a MSI using the Virtual PDF Printer software that you gave us. However we are running into some problems with the creation of our MSI. 2. We tried using pdfconfigcmd.exe but we don't know all of options and how to fill it out to get the result we need. 3. We tried to get around this by creating an exported copy of a working registry and a batch file to refill the registry entry. 4. This we found does work on systems where we have installed the pdf printer according to instructions in the past but have uninstalled for testing. 5. However, this does not work on systems where we have never installed it before. 6. This means there is something that pdfconfiggui.exe does that I am not triggering with pdfconfigcmd.exe or calling in my batch file. 7. On a smaller note this also means there is something being left behind when we do an uninstall. Please any assistance on this matter would be appreciated. Below is a copy of the instructions given to us so you do not have to go looking for it. 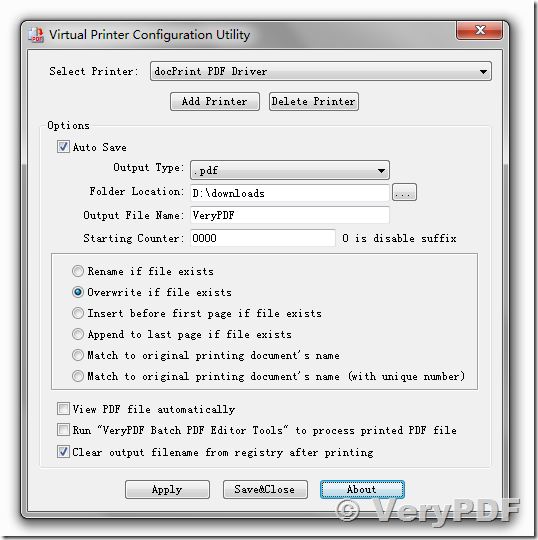 Q: How to add more virtual PDF Printers into my Windows system? 4. OK, you can print a Word document to these printers to create PDF files. Q: How to call our custom program after the PDF file is generated? Q: How to suppress Save As dialog? 3. OK, when you print a docment to Virtual PDF Printer, you will get a "D:\temp\out.pdf" file and without Save As dialog. 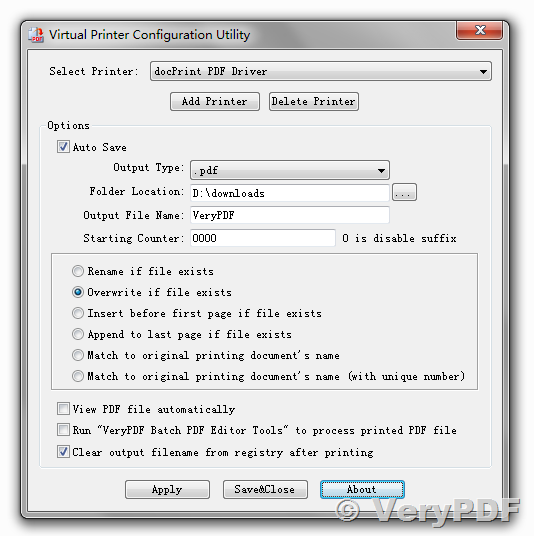 I have some experience with the Advanced Installer program we use to package the installer for the custom PDF printer. The problem is that we have to install this on a machine that has multiple users and we want to install to the Local Machine instead of the Current User, so that all users can use the printer. I can get it to install ok except that it is not calling my custom program and saving with the default name that I've put into the registry key. AutoExecProgram is set to "C:\CycomSQL\CyImportFile.exe"
AutomaticDirectory is set to "C:\CycomDat\out.pdf"
What happens now is that the system is prompting for a file name and location. I need it to use the automatic settings. Does this look right to you? What do I need to do to get this working? the PDF Printer will use HKEY_LOCAL_MACHINE to instead of HKEY_CURRENT_USER, please give it a try. Thank you for your expert instruction. It worked as it should! How to install and use docPrint Pro? This entry was posted in docPrint Pro and tagged PDF Printer, virtual printer.. Bookmark the permalink.